If you’ve been to any folk festival of note then there’s a good chance that you’ve seen a tallish wiry fellow standing behind a tripod. 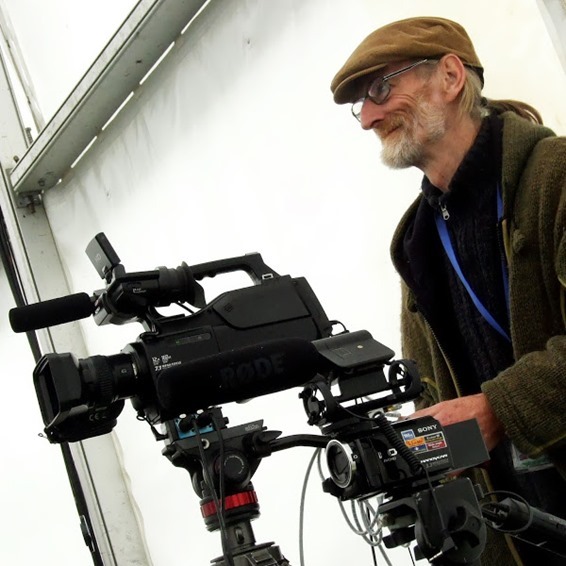 That’s Simmo, Peter Simmonds to be precise and it’s been his passion for some years now to make high quality video recordings of the great and the good and the bright new things on the English folk music scene. His YouTube site has now over ten thousand videos that are there to be enjoyed free of charge by anyone. He makes no charge to anyone funding everything from his own pocket and each act he films gets a hard copy. The always delightful Emma & The Professor with Kevin Willoughby and Jonathan Draper (Johnny Cello). But just think awhile on the amount of music that’s up there, online until the great spider that weaves the worldwide web dies. Music and musicians available to the entire planet at the click of a mouse. It’s an archive and as soon as you use that world it gains import, and why not? Peters vast collection is to my mind as valuable and important as anything in Cecil Sharp House. A perfect overview of folk music and indeed folk festivals in the first years of the twenty first century. When the singers and players have gone the videos remain. But Peter needs a little help to keep it all going so he’s set up a page on FundRazr. Click on the above and it’ll get you there and donate as much as you can and he can continue to do what he does very well, like the few I’ve put on here. I can’t finish without mentioning Drew, Batman has Robin, Sherlock Holmes has Dr Watson and Simmo has Drew and more power to them as the years go by.